When I started this series, I sketched out several hot pads for different holidays and seasons. It wasn’t long before I had at least one or two options for each month, even more for some. It hasn’t been too difficult to decide which one I would make each time…until now. 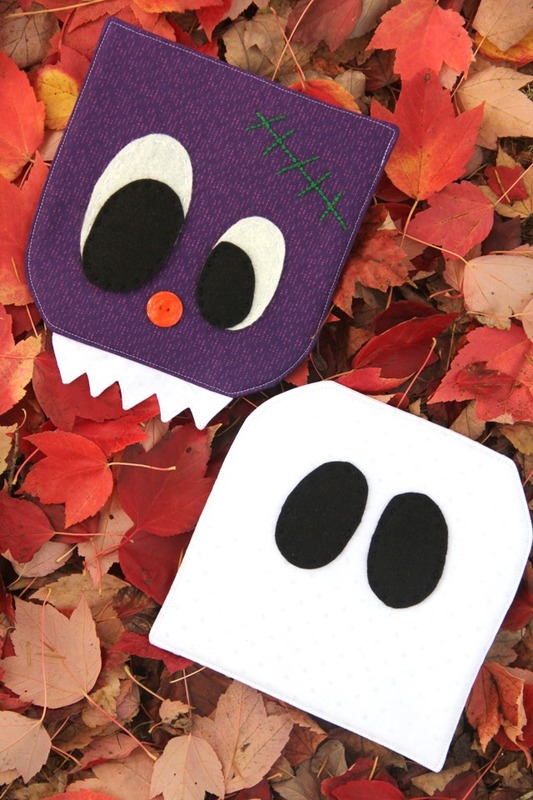 I couldn’t choose between my extra dorky monster and the ridiculously simple ghost, so I made them both. For October, you get an extra, bonus hot pad! 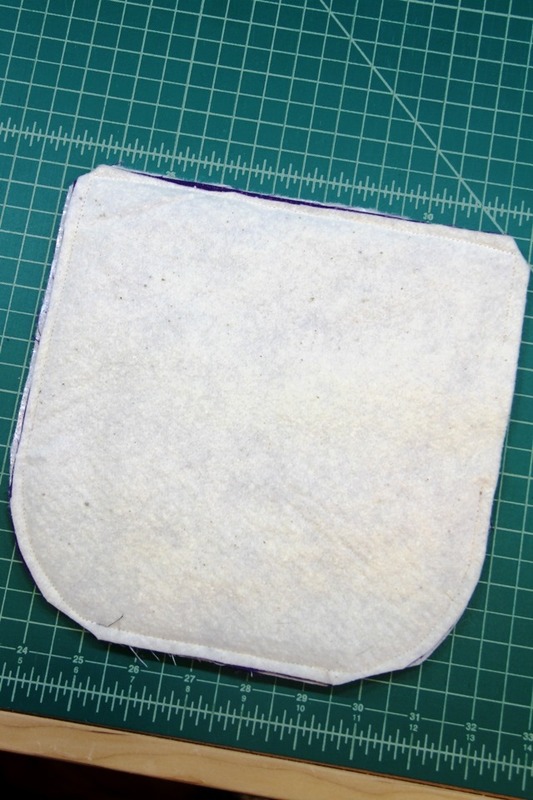 For those of you new to the series, I am making a hot pad each month for a year, using the same basic shape. I started in February and you can see all of the patterns here. Let’s get started on October! To make the monster, iron the interfacing onto the back of the face and to the back of the teeth. Stitch the eyes onto the face using the white embroidery thread. Add the black irises on top and stitch in place with black embroidery thread. Stitch the scar using a backstitch and green embroidery thread. 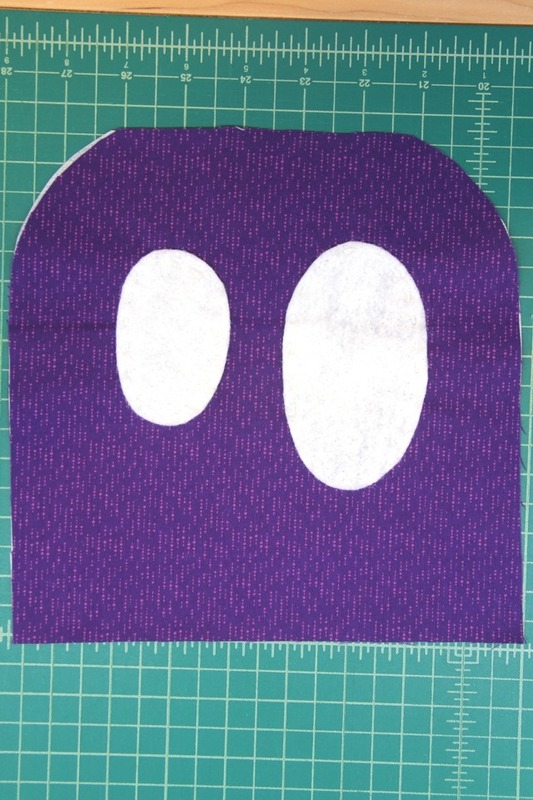 Add the button nose with sewing thread or embroidery thread. Pin the tooth pieces with right sides together. Stitch, leaving the long, straight edge open. Clip the corners and trim the seams. Turn the teeth right side out, using something pointy to push out the points. Top stitch close to the edge. To layer for stitching, start by laying the Insul-Bright with the shinier side up. Add the face, face up. Lay the teeth over that, with the points up, the interfaced side facing down and the raw edges even. Add the back over that, right side down, followed by the cotton batting. Pin well and stitch, leaving 3” open on one side for turning. Clip the corners. Turn right side out. Press, turning in the opening. Top stitch all the way around. 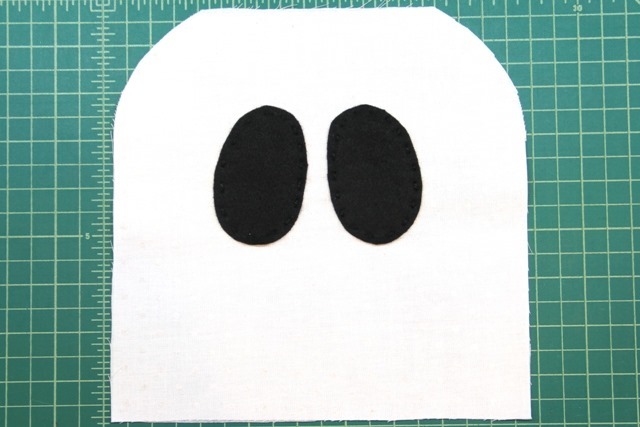 To make the ghost, iron the interfacing onto the back of the face and stitch on the eyes with black embroidery thread. Layer the Insul-Bright, face (right side up), back (right side down) and batting. Stitch around, leaving a 3” opening. Clip the corners, turn right side out and press, turning in the opening. Top stitch around the edge. These two would be cute individually, but they’re just so perfect together. Halloween buddies. And even better – throw in last month’s pumpkin!